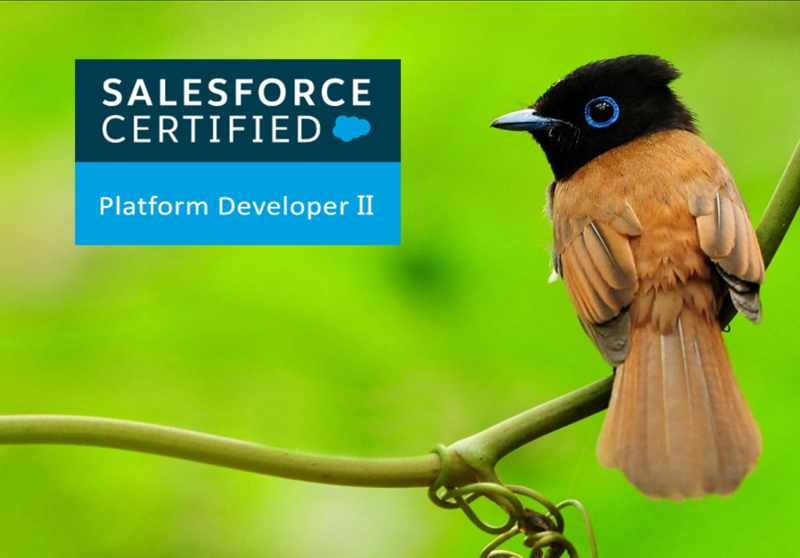 My Experience with the Salesforce Platform Developer II Certification. In this article, I would like to share my preparatory regime, experience and some pro tips for an awesome Salesforce community engineers. My journey with the Platform Developer II began as soon as I had cleared Platform developer I certification. I had immediately started preparing for Platform Developer II MCQ exam. Of course, it took around 5-6 months of study to clear the most challenging certification I ever had. You can get more information about Passing the Salesforce Certified Platform Developer II MCQ Exam from here. After clearing Platform Developer II MCQ exam, it was a time to wait for assignment window to open. Luckily after few months, I got an email from Salesforce and instantly checked for the available window. Initially, I wasn’t sure about registration as I was having vacation plans 🏂 (~10 – 15 Days without Laptop) which were clashing with assignment dates. However, I didn’t want to wait for another 6 months and on the certification guide PDF Salesforce University has recommended at least 20 hrs 😜, so without giving any second thought, I had registered for an open window. From past 7-8 months, I am working on lightning⚡ and not written any single line of VF code, so I had decided to drop my vacation plans if an assignment is very complex and needs detail understanding to complete it. When I got the assignment📝, I quickly went through it. At a high level, it consisted of a VF page, APEX controller, and trigger. After reading the higher level requirement I was quite relaxed as it seemed manageable and bag packed traveller was ready to fly✈ for vacation🏊. So if you have already cleared the platform developer II MCQ exam, then you are fully charged🔋for assignment. After returning from vacation I was having around 17 days📆 to complete the assignment (which include 2 weekend and 1 declared holiday), So I have decided to plan and analyse the requirement on declared holiday, I was still chilling 🎾🎳🎵🍹. ”There seems to be some perverse human characteristic that likes to make easy things difficult” – Warren Buffett. So after continues 2 days and 1-night efforts and dedication for ~28 hrs I was able to complete the 90% of the requirements with smoke testing (without negative testing and code coverage). So it was kind of amazing hackathon for me, but I loved it. It is real fun, especially if you are like me – a Developer who has strong command on programming skills and love to code and hunt any challenging puzzle associated with requirement or code, then you will surely have a fun!!! I was very much aware of “time will FLY!!!! ” so I decided to complete my assignment in next weekend and now I have only one weekend left so I took advantage of every minute, every second, every night. Finally last weekend has arrived and here my second PD2 hackthon started, moreover my target was to achieve 100% running application, quality testing of all the mentioned requirement, and 100% code coverage. Initially, I thought it would be easy as 90% of the application is tested and completed but yeah, I caught 2-3 technical glitches in the code while performing stress testing. Therefore after 25 hrs of continues efforts my application was ready to go live 🙂 Uff what a relief and satisfaction it was!! Woooo, after deploying and doing few rounds of testing I have submitted my application 3 days before the actual submission date. I also have to admit that I spent a lot more than the suggested 20 hours on my assignment (~65-70 hours), but that is just because it was so important to me that I passed. Build an application which is robust, scalable and ease to maintain. Start with Pseudo Code to get clear visualization of logic of the code, I believe that, Everything you think is a Logic and if it’s a Logic, it can be Coded!! Keep on reading the assignment from time to time in between, this will really help to get better understanding about the detailed requirement. Please, keep in mind that “winter is coming”, stop reinventing the wheel and keep an eye on the platform roadmap. Add some logical comments whenever required about the logic and approach you had taken. Mention all the assumption if you are not sure about the exact requirement. In my scenario I was having a few statements that were confusing about the functionality, so I had raised a case to salesforce university support for clarification, but unfortunately, I haven’t received reply prior to submission. So in this situation, you have to select the best possible way of delivering the application and mention your approach and assumption as comments. Analyze requirement properly, 20 hrs isn’t sufficient for completion. Make sure you are following best approach for writing the triggers , I have followed the trigger factory approach. Plan you design well in advance so that you don’t stuck in infinite loops of changing the design. Follow the APEX best practice, VF best practice and TRIGGER best practice to deliver the application which is scalable and robust. Follow this golden rule: “Try to do calculations first in SOQL or Aggregate Queries, then in APEX and finally in Visualforce”. Time will FLY!!!! Complete your assignment as soon as possible. Application Testing – Yes, as you are the Dev and QA, it’s your responsibility to perform manual testing as well as apex based testing for the PD-2 application. Create a proper set of data which will allow you test both +ve and -ve testing. Test your application functionality wise first than jump to end to end testing. Do multiple rounds of testing considering all the validation rules and other specific requirements. Perform bulk testing by using either developer console or workbench. Check for the exceptional scenarios. Keep in mind that your code should handle all the exceptions gracefully. Do few rounds of testing after moving code to production environment. A target for 100 % code coverage or at least ~98%. Write Test Methods to test data security. Use runAs in your test coverage to test the solution using the profiles you expect. Follow the testing best practice. Write Test Methods to test bulk data processing, negative scenarios, positive scenarios, exceptional scenarios and boundary conditions. Cross check all the expected results with assert statements. Don’t try any keyboard shortcuts like copy paste, it will terminate the open window. Don’t panic if you do so, call the instructor, he will again use some keyboard shortcuts and then you can resume your easy exam. Please visit bob buzzard’s blog, Paul Battisson’s blog and one of my guru Mohith Shrivastava’s blog to get more insight about the easy exam. Where can I find more information about the Platform Developer II certification? It is most challenging and respected credential that I have earned till now, go for it folks if you think you can crack it 🙂 ALL THE BEST!!! Don’t forget to tweet me @JitenJoysar if you have any questions or needed any further guidance.